We did it for the Chooks! 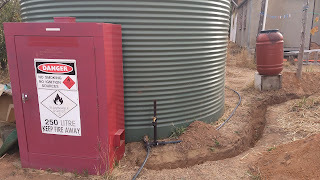 Since we got back from our little holiday, we have been working on the plumbing for the rain water tank. 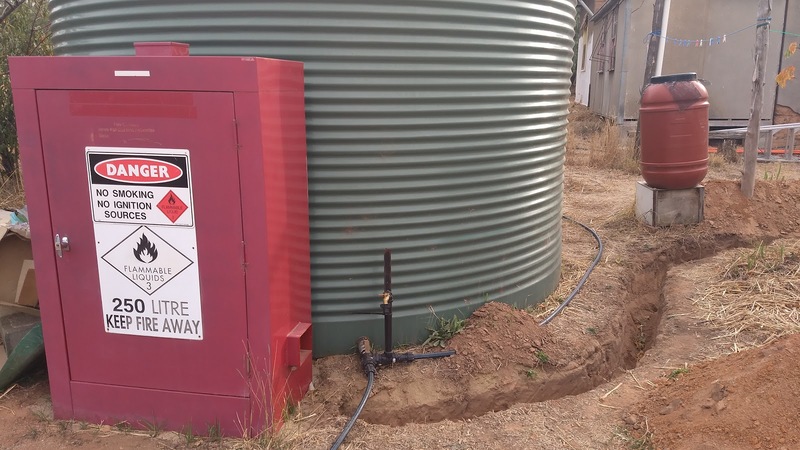 The soil was so dry and hard when we started, we hired a jackhammer to get the trench down to the required level for the electricity to run from the solar command centre to the chemical locker that we're using as a pump station. Of course, it rained after we installed the electricity. Good thing that it was finished, but a shame because some rain would have really helped with the digging. Can't have everything! We are also taking this opportunity to re-do the plumbing from the roof guttering to the tank. It's been going strong for 3 years now, un-glued, only held up by poles in the ground, but it's time to finish it properly. Not long to go now. 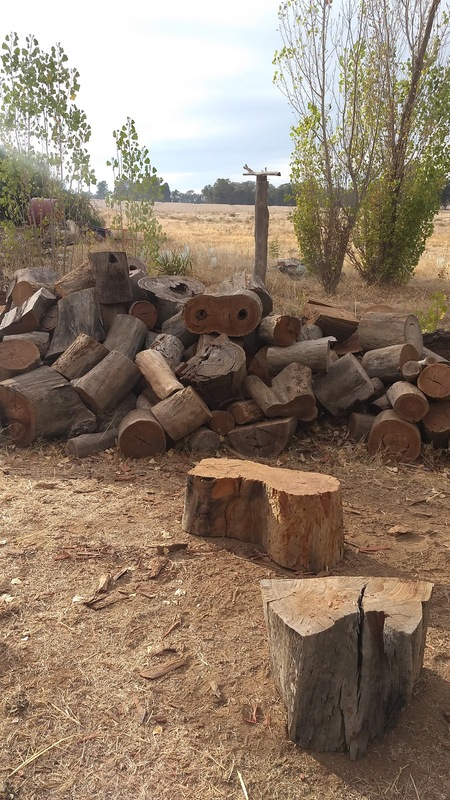 We got a little distracted by this awesome pile of wood that Marty arranged to be delivered. Oh my, this wood is extreme! The knots, twists and tenacity, it was very challenging. We learned that you have to chop with the growth rings, and not against them (ie: you can't split this stuff!). Marty and I were happily breaking it down by axe, maul and wedge / sledge hammer combination, one wheelbarrow at a time, but we were offered help by a friend from in town, and we didn't say no! It was raining a little as the wood splitting machine made .. uh, not quite what you'd call "light work" of it, but certainly made life a lot easier for us! The whole pile was done in a few hours and they took off to start splitting a pile for another in need. We're very grateful for the help, but also a tiny bit sad that we'll miss out on any more wood splitting fun we had together. There's nothing quite like the feeling of using all your strength and power, axe in hand, the satisfaction of getting a chunk of wood to come off. 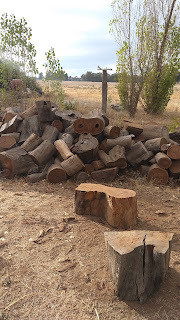 I think this wood pile will last at least 2 years, since it filled both the wood shed and a big old wood rack we got an a clearing sale years ago now.. so it'll be a little while before we get to do it again. Considering the wood only cost about $600, I think it was money well spent. Mantid in the morning sun, and a relaxing long weekend.